Mohammad Yousuf (Punjabi, Urdu: ? ; formerly Yousuf Youhana, ???? ????? ; born 27 August 1974) is a Pakistani right-handed batsman. Prior to his conversion to Islam in 2005, Yousuf was one of only a few Christians to play for the Pakistan cricket team. 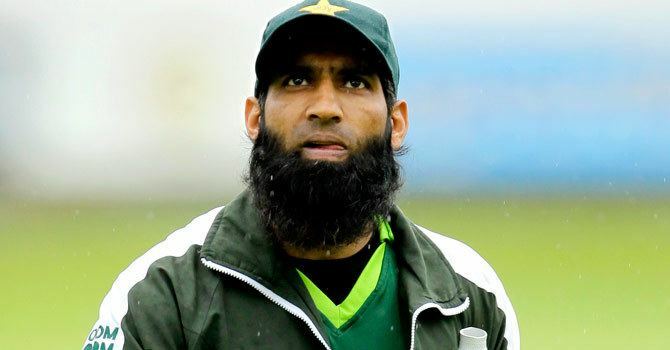 Yousuf was effectively banned from playing international cricket for Pakistan, for an indefinite period by the Pakistan Cricket Board on 10 March 2010, following an inquiry into the teams defeat during the tour of Australia. An official statement was released by the Pakistan Cricket Board, saying that he would not be selected again on the grounds of inciting infighting within the team. On 29 March 2010, Yousuf announced his retirement from all forms of international cricket, a direct reaction to the indefinite ban handed out to him by PCB. However following Pakistans disastrous first Test against England in July/August 2010, PCB decided to ask Yousuf to come out of retirement. Yousuf was born in Lahore, Punjab, Pakistan to a family who had converted from a Hindu low caste Balmiki to Christianity. His father Youhana Maseeh worked at the railway station, the family lived in the nearby Railway Colony. As a boy, he couldnt afford a bat and so swatted his brothers taped tennis ball offerings with wooden planks of various dimensions on surfaces masquerading as roads. As a 12-year-old, he was spotted by the Golden Gymkhana, though even then only circumstances dictated his ambitions and never thought of playing cricket, to make a living. He joined Lahores Forman Christian College and continued playing until suddenly giving up in early 1994. For a time he tried his luck driving rickshaws in Bahawalpur. Yousuf, hailing from poor background, was plucked from the obscurity of a tailors shop in the slums of the eastern city of Lahore to play a local match in the 1990s. His well-crafted shots attracted attention and he rose through the ranks to become one of Pakistans best batsmen. He was set to work at a tailors when he was pulled back by a local club was short of players. They called him to make up numbers and made a hundred which led to a season in the Bradford Cricket League, with Bowling Old Lane, and a path back into the game. He made his Test debut against South Africa at Durban and One Day International debut against Zimbabwe at Harare. He has scored over 9,000 One Day International runs at an average above 40 (2nd highest batting average among Pakistani batsmen after Zaheer Abbas) and over 7,000 Test runs at an average above 50 (2nd highest batting average amongst all Pakistani batsmen) with 24 Test centuries. He has the record of scoring the most runs without being dismissed in the One Day International match, with a total of 405 runs against Zimbabwe in Zimbabwe in 2002–2003. He has also scored a 23-ball fifty and a 68-ball hundred in One Day International. In Test match, he has scored a 27-ball fifty, which is 3rd fastest by any player. He was the top scorer during the successive years of 2002 and 2003 in the world in One Day International match. In 2004, he scored 111 runs against the Australians in the Boxing Day Test. In December 2005, he scored 223 runs against England at Lahore, also earning him the man of the match award. Seven months later in July 2006, when Pakistan toured England, he scored 202 runs and 48 in the first Test, again earning himself the man of the match award. He followed up with 192 in the third Test at Headingley and 128 in the final Test at The Oval. Yousuf was named CNN-IBNs Cricketer of the Year for 2006, ahead of the likes of Australian captain Ricky Ponting, West Indies Brian Lara, Australian spinner Shane Warne, South Africas bowling spearhead Makhaya Ntini and Sri Lankas Muttiah Muralitharan. He was selected as a Wisden Cricketer of the Year in the 2007 edition. Yousuf became the fourth recipient of the ICC Test Cricketer of the Year award for 2007, he scored 944 runs at an average of 94.40 including seven centuries and two fifties in just 10 innings and that was enough to be awarded the honour ahead of English batsman Kevin Pietersen and Australian batsman Ricky Ponting. On 29 March 2010, Yousuf announced his retirement from all forms of international cricket, just days after the Pakistan Cricket Board imposed an indefinite ban on him. "I received a letter from the PCB that my staying in the team is harmful for the team, so I announce my retirement from international cricket", he said at a press conference in Karachi. On 27 March, Yousuf said that he had decided to retire from international cricket. "Yes, I have decided to retire as Pakistan player and my decision is not an emotional one", Yousuf told press agency AFP, "Its of no use playing if my playing is harmful to the team". He was handed over an indefinite ban by the Pakistan Cricket Board for his disciplinary problems on Pakistans tour of Australia 2009–2010.